The CPU Shack is pretty much on the trailing edge of technology, we are, after all, a museum. However, we fancy the new technology as well, and like to crack it open for a look see. The iPhone, in its 4th generation, is an oasis of CPU’s, sadly we have not been able to get one. That has now changed…. Anthony, of the iPhone repair company Milliamp.com has graciously donated the logic boards from a iPhone 2G, 3G and 3GS. No 4G iPhones yet, but perhaps later. Now there has been several teardowns of iPhones as they came out, notably by the good folks at iFixIt. We are going to explore the many CPUs in each model of iPhone, the changes made as they evolved, and something new though not entirely unexpected. On a device such as the iPhone it is common to have two separate CPUs that run the phone. The Baseband Processor runs the underlying hardware of the phone (the radios, etc) This is critical timing wise so it runs its own OS, a Real Time OS capable of dealing with all the complexities in making a phone call or sending data to a cell tower. The Applications Processor runs just that, the applications, such as iTunes, and iOS itself, this way they are independent of the phone portion. This way if say the new game you installed crashes, it does not effect your phone talking to the tower. In addition to the applications processor and baseband processor there are several others. The GPS has its own processor, as does the Bluetooth, and the Wifi as well as the touchscreen. Some of these are pretty simple CPUs, but think back a few years. The CPU running JUST the wifi in an iPhone is faster then most desktop computers 15 years ago. The Original iPhone and the 3G used the same app. processor, an ARM11 based CPU made by Samsung. It initially ran at 400MHz but via a software update was bumped up to 412MHz. The biggest change in the 2G to the 3G was the addition of GPS and a change in Baseband. the 3Gs baseband ran at less then 200MHz, but the 3G runs at up to 312MHz, and included 2 actual ARM processors. add in the CPUs that runs the touch screen, GPS, wifi, and bluetooth and you scan see there is ALOT of processor power in the phone. 7 DIfferent CPUs just to make the phone work. The 3GS iPhone boosted the speed of the applications processor considerably (and thus it runs iOS4 MUCH better then the 3G). Again the app processor is made by Samsung, but now its clocked at 600MHz, and based on the ARM Cortex-A8, a faster core then the ARM11 design. This processor will do 800+MHz but Apple underclocks it for the sake of battery life. 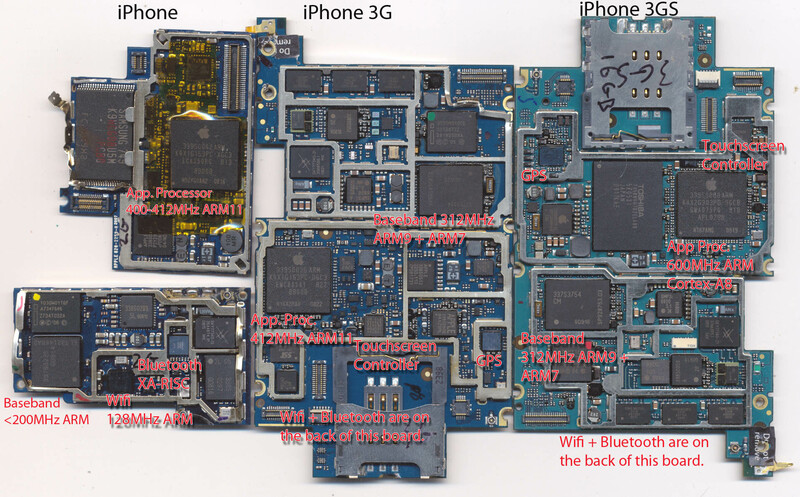 The baseband remains the same, but APple used an integrated chip to handle both the Bluetooth and the wifi. Its common for a design to evolve somewhat in the life of a product. This seems to have happened considerably within iPhone generations.